The date and time displayed by ls -l can be changed to any format you want. To change the format of the date and time use the --time-style option. Values that can be passed to it are long-iso, full-iso and iso. You can also specify your own custom format as a string. In C++11 and later versions, date and time is supported in the standard library through the chrono header file. To print out the date and time, you may still have to fall back on the std::time_t and std::tm structures and std::ctime and std::localtime functions from the ctime header file and std::put_time from iomanip header file. The easiest way to obtain the date and time string in C++ is to use time, localtime_s and asctime_s. The output string is of the form Tue Aug 02 15:11:23 2011. The date and time format can be changed to anything that you are comfortable with. Install the package dconf-tools from the Ubuntu repositories. This installs the dconf-editor which is needed for changing the configuration. Open dconf editor from the Dash or dconf-editor from the shell. 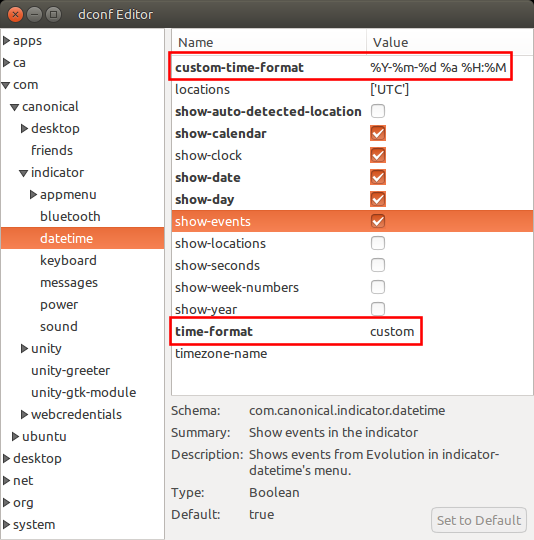 In the editor, navigate to com.canonical.indicator.datetime. Change the time-format field to custom. In the custom-time-format field, change the value to the desired format. The format can include both the date and time specifiers. This format uses the same specifiers as that of the C standard library function strftime(). The changes should take effect immediately and the date-time should change in the panel. 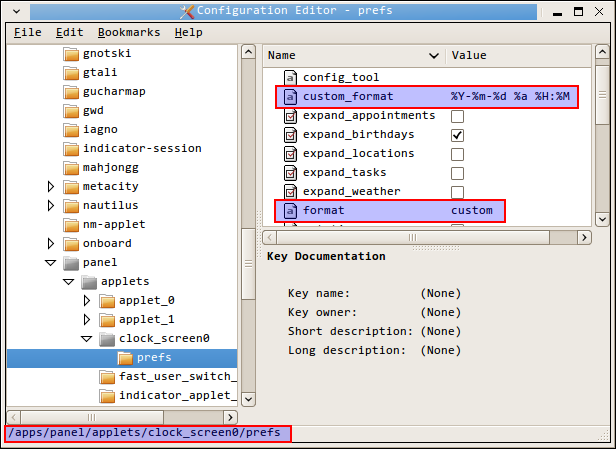 Use gconf-editor. Navigate to /apps/panel/applets/clock_screen0/prefs. Change format field to the string custom. Change the custom_format field as described above.